"Night Fishing with Cormorants" is a very loose and abstract meditation, inspired in part by the 17th Century Japanese screen painting by Kano Tanyu, "Night Fishing with Cormorants", and by the very stark and beautiful novel of Akira Yoshimura, "Shipwrecks". I am not telling a naturalistic story in this piece, but rather I have tried to make a work that will hold in equal reverence the spirit of the bird, the fish, and the fisherman. Music by The Headroom Project, “Winter Skies”, from the CD, Dominatus Illuminato Mea. 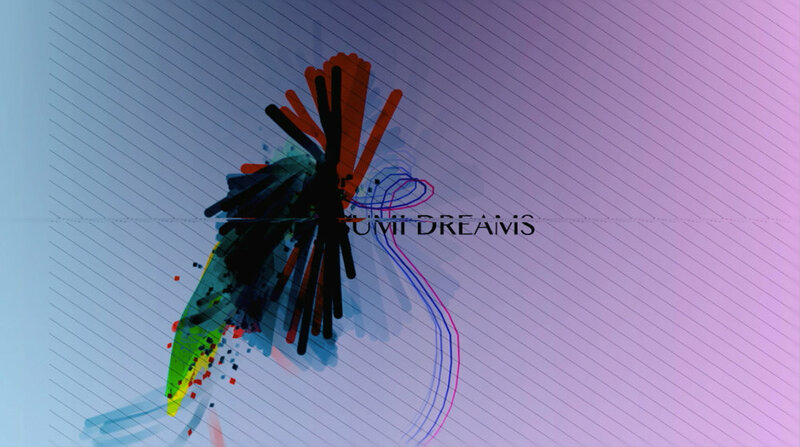 “Sumi Dreams”, 2014 . Online version not currently available. All the Possible Braidings is an abstract choreography. Once I had completed the 3D portion of the animation, this film sat on my desktop for a year without any music before I heard this beautiful cello piece by Jamie Sieber and knew that it was a perfect fit for the mood of the animation. It was first screened in the Visual Music Marathon in Boston in 2007, a festival dedicated to exploring the many possible relationship of music and graphics. Below is a selection of experimental motion sketches done as personal projects. The gentle melody of the piano is reflected in the languid movements of the forms, part brush strokes and part dancers. Using the basic constructivist vocabulary of simple primitive shapes, I created a rhythmic arrangement of these elements, always balancing choreography with the more painterly elements of color and light. Nothing is synced with the music in this piece as the music and animation were brought together after the final visual mix had been completed. During this time I used to do a short motion sketch everyday as part of my art practice. They were usually under one minute, and explored some part of the 3D software that I was learning or teaching. They were inspired by music that I was listening to at the time, and I had no other agenda than to have fun. Cloning objects yields a fractured yet rhythmic unity that is play to forces of attraction and repulsion. This creates an environment where sound and graphics work as parallel entities to create a new kind of wholeness.